The boat set off bright and early in the morning on the five-hour journey to Makarska. We paused for two hours within a secluded bay and we were the only boat in sight. It’s always good to get off the boat and stretch your legs in the water. Lunch was served as we left the bay and we were treated to a show from dolphins swimming alongside the boat. But after lunch things went sideways. Difficult weather conditions meant that we had to moor for a while before continuing our journey. And as it was pouring with rain not everyone wanted to swim. 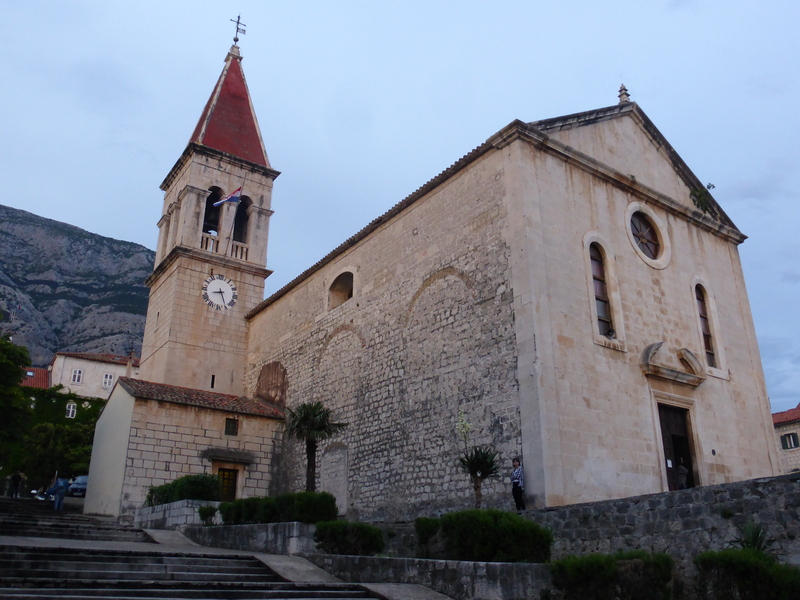 Eventually we set off again and, when we arrived in Makarska, the weather was fine. And that lasted just long enough for me to walk as far as possible from the boat. So I stopped for coffee. And this is why my pictures of the town have a watery quality to them. Matarska is on the mainland but still very much geared to tourism. In order to avoid to much soggy trudging around trying to find dinner, I decided to follow a Lonely Planet recommendation and eat at Konoba Kalalarga. The menu changes daily so no menu to look at just a waiter listing off enough things to confuse me totally. In the end, I plumped for the sea bream for no particular reason other than I had fallen into the psychological trap of only remembering the things at the beginning and end of his list! And, lo, it was good. One issue I have with some countries is that after having served a salad, they don’t think you need cooked vegetables with the main dish. 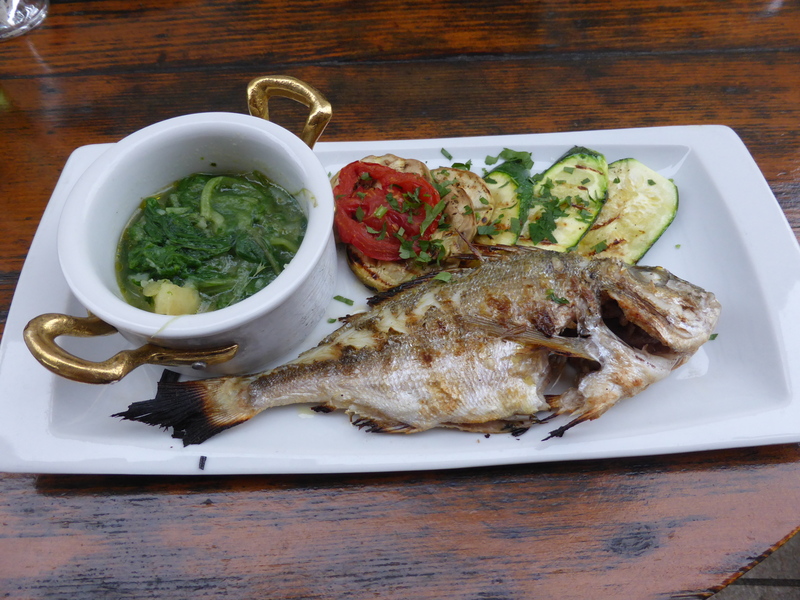 Thankfully, this hasn’t been the case in Croatia and my sea bream was served with three vegetables, as well as a potato dish cooked with kale. It was all delicious. If ever you get the chance to eat at Konoba Kalalarga, I’d recommend reserving a table or arriving early – it’s very popular. I had a lovely walk around the harbor back to my boat, accompanied with my nightly relief that I hadn’t misunderstood the information provided in German about the length of our stay. We were the boat next to the harbor tonight and so I didn’t have the voyeuristic pleasure of investigating any other boats as I passed through. I could really get used to living on a boat though. Well, as long as it came with a crew. Put on a lovely summer dress, went upstairs for breakfast and discovered it was pouring with rain. Dodgy weather meant that we didn’t leave Makarska till 10:00 but that, and the lack of an opportunity to swim, meant that I got to have a lazy morning catching up on travel planning. 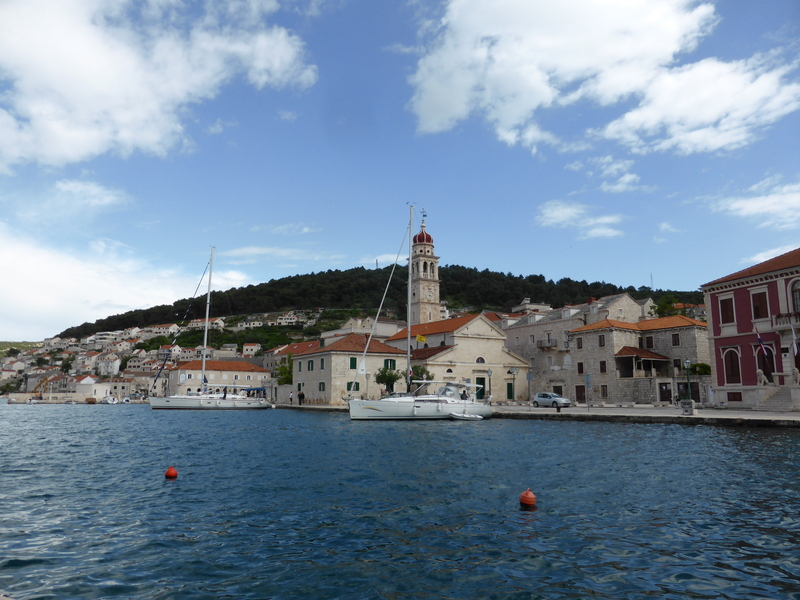 We sailed from Makarska to the Island of Brac and by the time we arrived there, the sun was shining. 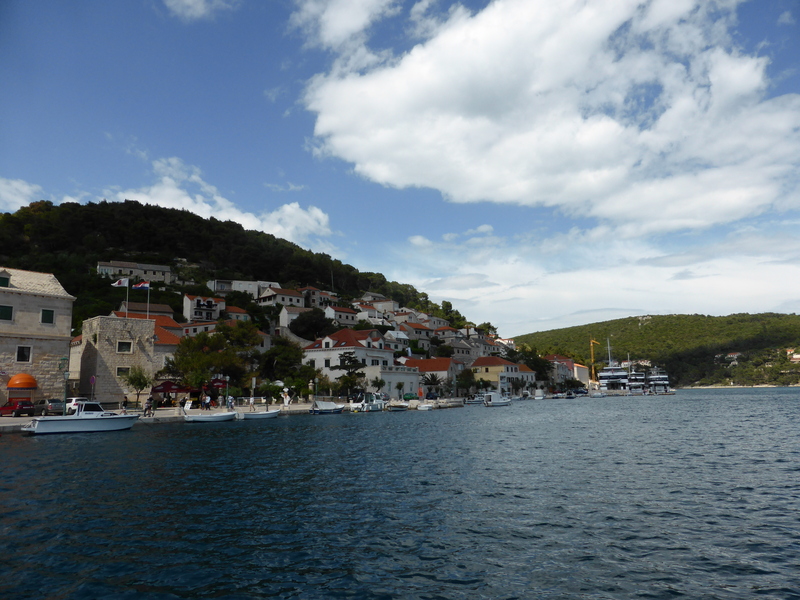 The town of Pučišća had a different look than many of the places we’d visited. The buildings were very white which made them quite striking in the sunlight. I wandered up and down and round and about. And after a good wander round, I discovered why dinner was being served on the boat that evening. There is nothing in the town. Beautiful architecture, lovely walks round the coastline but restaurants, not so much. 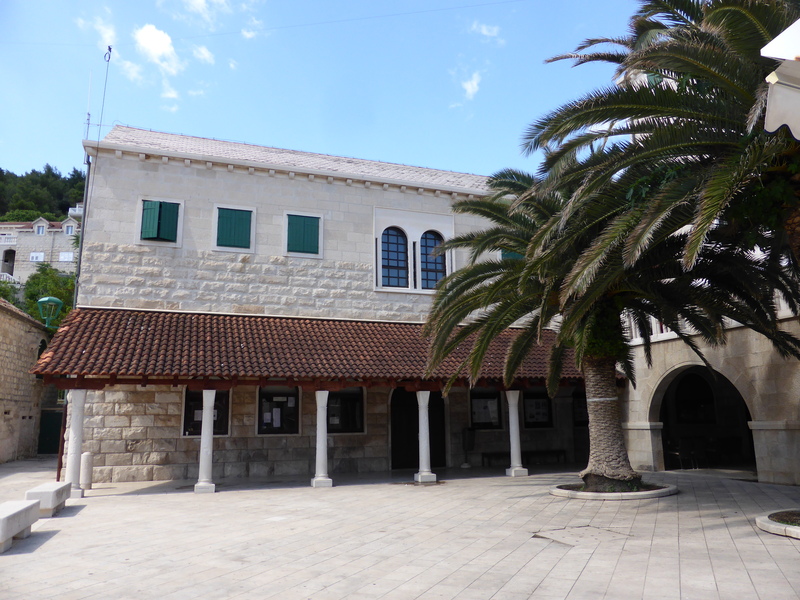 Of all the places we visited on the cruise, Pučišća was therefore probably the least interesting.